EA games is now finally going release ‘Need for Speed Most Wanted 2012’ which will be available on October 30th later this year. This version of Need for Speed Most Wanted is very well design and very good in graphics the game will be available for both PlayStation 3 and X Box 360 and a android version will also be launch for android user. 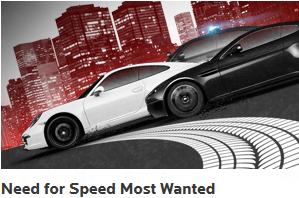 The new Need for Speed Most Wanted 2012 game has so much to offer to their gamers, this game has some of the best features and best racing experience the graphics are so good which gives you a real car racing experience.